Consulting giant Accenture dubbed today’s environment “The Switching Economy”—with good reason. Their research shows customers are leaving brands at an alarming rate–leading to billions in global business losses. Why is this happening? Today’s customers have abundant information about companies available at their fingertips. If an interaction with a company does not live up to their expectations, customers can research competitive offerings and shift loyalities with ease. While bad experiences motivate defections, good ones can inspire customers to stay loyal—and purchase more. And there is more good news. Accenture research also found that 81% of people who switched service providers said brands could have done something to retain them as customers. Empower frontline managers to resolve issues with unhappy customers. This proactive approach to customer dissatisfaction can help you transform a poor experience into a positive one—and keep more customers. 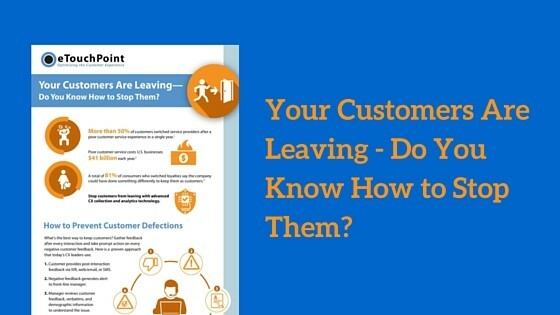 Want to learn essential best practices for preventing customer defections? Our infographic gives a step-by-step overview of a proven CLA approach embraced by today’s CX innovators.